The Episcopal Diocese of the Rio Grande (DRG) is the Episcopal Church’s diocese in New Mexico and Far West Texas, the portion of the state west of the Pecos River. The total area of the diocese is 153,394 square miles. The current diocesan directory lists 56 active congregations within the diocese, with four emerging congregations. The see is based in Albuquerque, New Mexico, with offices at the Bosque Center on the lovely west mesa. New Mexico, which became a territory in 1950, did not impress our first eminent Episcopal ecclesiastical visitor. Bishop Josiah Cruickshank Talbot, who first ventured south in 1863, found Santa Fe “exceedingly unprepossessing . . . the streets are very narrow, uneven and dirty,” and he took an equally dim view of the morals he found in Santa Fe. Santa Fe was assigned to a variety of clerical jurisdictions until 1880 when General Convention of the Episcopal Church elected George Kelly Dunlop to fill the vacant episcopate of Missionary Bishop of the Territories of Arizona and New Mexico. It was in 1882, during Bishop Dunlop’s episcopate, that the Church of the Holy Faith was built in Santa Fe. Bishop Dunlop was succeeded by John Mills Kendrick in 1888. His assignment—New Mexico, Arizona, and a portion of Texas, covering 236,313 square miles—was perhaps the most difficult within The Episcopal Church of the day. His successor bishop left little mark, but Frederick Bingham Howden, who was consecrated bishop in January 1914, served the church in New Mexico and West Texas during the creation of its present cathedral, St. John’s in Albuquerque. Father Ted Howden, Bishop Howden’s son, served as chaplain to the 200th Coast Artillery when it was federalized and sent to the Philippines early in 1942. His feast day is celebrated each year on December 11th in all four deaneries of the diocese. James Moss Stoney was elected to succeed Bishop Howden and was consecrated Bishop of the District of New Mexico in April 1942. Stoney served as a missionary bishop for ten years before the district became a diocese in 1952. Camp Stoney, the diocesan camp located southeast of Santa Fe, is named after him. Bishop Stoney was succeeded in 1956 by C. James Kinsolving III, the rector of Holy Faith at the time. By the end of his tenure in 1972, Bishop Kinsolving had been forced to deal with a number of issues arising out of the tumult of the late 1960s and early 1970s. On the whole, however, the diocese fared well during his administration and demonstrated considerable growth. Bishop Kinsolving’s successor, Richard M. Trelease, became the diocesan bishop in January 1972. He was a strong supporter of the 1979 Book of Common Prayer and the Hymnal 1982, along with the ordination of women. The result was a doubling of diocesan clergy, as well as an unfortunate decrease in the number of confirmands and communicants. The consecration of Terence Kelshaw in 1989 represented a conscious departure from the Trelease era. Funds were withheld from the national church, which mirrored the bishop’s and many others’ growing alienation. Bishop Kelshaw was highly visible, both locally and nationally, as a strong proponent of traditional values and theology. By the end of his administration, Kelshaw had increased the estrangement of the diocese from the national church. By his retirement in 2005, the diocese was perceived as one of the most conservative in the church. Bishop Kelshaw’s ministry was followed by the short-lived administration of Bishop Jeffrey Steenson, who had been Bishop Kelshaw’s Canon to the Ordinary for five years. Like his predecessor, Steenson left the Episcopal Church shortly after he stepped down as bishop. The Reverend Dr. Michael Vono, a rector of St. Paul-s-Within-the-Walls, Rome, Italy, was elected the ninth Bishop of the Diocese of the Rio Grande on the third ballot. He was consecrated bishop on October 22, 2010. Under his leadership, we enjoyed an increasing rapport with the national church and a healing and ever-strengthening diocese. Among Bishop Vono’s most notable achievements were the renovation and creation of the Bosque Center and the fostering of unity among the clergy and congregations. In addition, the diocese rejoiced together when our Canon to the Ordinary, Father Daniel Gutierrez, was elected Bishop of Pennsylvania in 2017. On May 5th, 2018, the DRG elected the Reverend Canon Michael B. Hunn, Canon to Presiding Bishop Michael Curry, as our tenth Bishop. 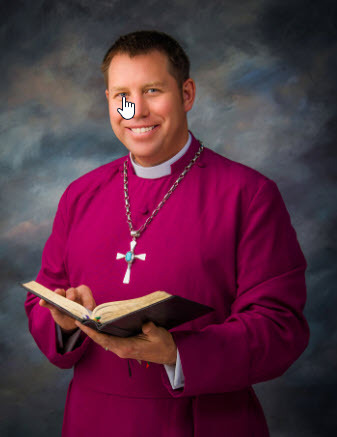 Bishop Hunn was consecrated on November 3rd, 2018, at the annual Diocesan Convention. It is with a sense of joy and anticipation that the DRG welcomes our new bishop!